On Saturday, August 27, 2005, New Orleans chess player Rene Phillips wasn’t thinking about the hurricane that would soon change his city and his life. Phillips’ attention was on the Louisiana State Blitz Chess Championship, held in the southwest Louisiana town of Sulphur. He went 7-2 for a second-place finish. The tournament over, he told his kids that he was too tired to drive back to New Orleans; they’d grab a hotel room and relax. But when Phillips turned on the hotel television, he saw that Hurricane Katrina was bearing down on New Orleans. He tried to contact his family, including his mother, a nurse who was on duty at a local hospital. Over the next couple days, he realized that his residence at the New Orleans Baptist Theological Seminary was flooded and that he’d lost everything. His mother stayed at the hospital, heroically helping her patients. Phillips knew how to react quickly, both in chess and in life. An ordained minister, he had served as a police officer for 22 years and was a member of the S.W.A.T. team. Now, he faced a new set of unfamiliar moves. "I couldn’t get any money. I couldn’t show any fear in front of my wife and kids. We didn’t know where we were going," he says. He decided to head for Philadelphia. But Phillips’ extended family – he was looking after a group of 13 – didn’t have enough money to get that far. Then a call came in from Daaim Shabazz, who runs the Web site The Chess Drum. Shabazz immediately wired Phillips $200 and began calling every few hours to guide the family to Philadelphia, supplying directions and making hotel reservations. More than anything, Phillips says, Shabazz helped him keep his sanity. In Philadelphia, some of the city’s top chess players hurried together a benefit tournament that took place on Sept. 25. Shabazz called in to check on the tournament’s progress. "I was told brothers were ‘droppin’ hundreds,’" Shabazz reported on The Chess Drum. Phillips and his family received a television, a microwave and $1,200 on the spot. "All these years, my wife said, ‘You spend too much time playing chess,’" he says. "But I’ve never been so proud to be a chess player or a black chess master. It wasn’t the church, it wasn’t the Red Cross or FEMA, it was a chess player over a Web site in Florida I never met before. God used him as a link to get us the resources we needed to survive." A contender for Rene's second proudest moment as a chessplayer is the following victory over GM Gabriel Schwartzman. When New Orleans flooded, there was panic in the chess world just like there was panic everywhere. "Game’s History Taken By Storm," cried the New York Post, which mistakenly reported that chess legend Paul Morphy’s Royal Street home – now the site of the famed Brennan’s restaurant – was under water. Most of the early attention focused on Jude Acers, a celebrated player whose whereabouts became unknown following Katrina. Acers is known for playing street chess in the French Quarter, his head topped by a red beret that he says acts like a stoplight for passing tourists. After staying in New Orleans for nine days after the levee break, he made his way to a shelter in Greeneville, Tenn. Chess sites soon posted a letter from Acers, in which the 61-year-old player described running "the night gauntlet" in the flooded city to get rations for his 80–year-old landlord. 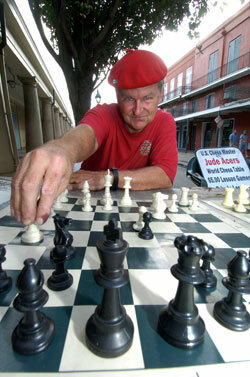 By October 2005, the French Quarter seemed like a ghost town, but Acers’ chess table was back up and running. It was heralded nationwide as one small sign that the French Quarter would regain both its character and its characters. "In my own running narrative about life in the French Quarter, Jude Acers never loses," wrote Kane Webb, a columnist for the Arkansas Democrat-Gazette. New Orleans is best known as the birthplace of jazz, but the city has a storied chess history, as well. Most chess players know that Paul Morphy was a New Orleans native. It’s lesser known that the city was one of the nation’s chess centers throughout the 19th century. In 1887, the city’s chess club had 700 members; the next largest was the Manhattan Chess Club with 200 members, according to a report in Harper's New Monthly Magazine. Early 20th-century chess magazines continued to cite New Orleans’ high standing in the game. In later years, the New Orleans Chess Club’s notable members included the city’s district attorney Jim Garrison, who during his notorious JFK assassination probe reportedly spoke in coded chess moves over the phone to elude suspected wiretappers. Yet much of New Orleans’ chess action has taken place outside of organized clubs and tournaments. When local chess coach John Parsons launched the popular music club The Maple Leaf Bar, he put a chess table in the window to attract local players. And one of the city’s leading jazz musicians, Irvin Mayfield, says he and his boyhood friends would jump backyard fences to go watch the old men in the neighborhood play chess. Mayfield says he likes chess because it’s a game of improvisation. "Chess is a lot like jazz," he says. "You have the form and structure, but inside, there’s a lot of room for freedom. The more you understand the laws, the more freedom you have with it. The chess board is just an instrument." A frequent opponent for Mayfield has been the city’s former police chief Eddie Compass. One morning, Mayfield recounts, he showed up at Compass’ office with fellow trumpeter Wynton Marsalis at his side. "I had Wynton against the ropes," Compass says, laughing. "But I need quiet and Irvin knows this. I was a piece up and was about to go in for the kill, and Irvin was talking the whole time, and I touched the wrong piece. Wynton gave me the death blow. That game haunts me to this day. I’m ready for the rematch, and Wynton knows it. But next time I’m going to put tape on Irvin’s mouth." Compass says it was during the first hellish week after Katrina that the police chief most recognized the real value of the game. "Chess helped me tremendously after Katrina," he says. "I wasn’t getting much sleep, and I would go over past chess games like a mental exercise to keep alert. Where I had made mistakes, I’d go over those mistakes over and over. Chess settled my mind." Before Katrina, student chess in New Orleans was going strong, with students like Trevor Jackson and Jordanna Williams winning top national prizes. The most recent New Orleans scholastic league before the flood had 105 teams, totaling about 800 kids. But for scholastic chess, 2005-2006 became the missing year. Top scorers got out of their game during the evacuation. Some returned to playing to discover that they’d been outpaced by competitors from other cities. Many never came back to New Orleans – or if they did, their coaches didn’t. "Last year, we got back together after Katrina, and we had a couple tournaments, just to let everybody know that we’re going to do it again," says David Pierson, who founded the Louisiana Scholastic Chess League in 1985 and recently returned as its president (www.lscl.org). "We had maybe 60 to 80 kids in each division. We were smaller than the gym." Pierson says that he’s relaunching the league for the same reason he started it in the first place: to show it can be done. "All the way back to the beginning of when we started it, we constantly heard how Louisiana can’t do this, or can’t do that, and how we’re on the bottom of every list. The idea was to use chess as a metaphor, so people would see that something good must be going on in Louisiana." Pierson says the past year has taken a toll. In addition to Phillips, top teacher and frequent Louisiana champion Alfred Carlin is no longer in the city; he’s living in Dallas. The hardest-hit school was Ben Franklin Elementary, which, in the 2004-2005 school year, won top prizes in the city and state. In the fall of 2005, it was the first public school in New Orleans to re-open after the hurricane – but it no longer had a team or a coach. "We started the team from scratch," recalls John Johnson, Ben Franklin’s former coach, who moved to Conway, Ark., following Katrina. Johnson says he’s stayed in touch with his chess parents, most of whom are scattered across the country. One mother started a club at her new school. And last spring, when the New Orleans league hosted its first tournament after the flood, Johnson’s top player drove in from Atlanta to represent his old school. The student called Johnson on the cell phone after every game. He won first place. Johnson still chokes up at the memory. "The group I had was really a special group of kids," he says. "They supported one another. That was our family." Last fall, Mike Troendle entered his eastern New Orleans warehouse for the first time since the levees broke. That’s when he saw what 12,000 chess sets look like after a flood. He started digging in the wreckage, hoping to maybe salvage a few boards, but came up empty. There was no insurance. Troendle now has his Internet company CajunChess.org’s Web site back up and a new storage facility in Alabama. He’s also gotten his old weekly chess club going again, at a local coffeeshop. But they’re getting maybe a third of the players they got before the storm. "A lot of the targets are taken away," he says. "What keeps kids going is if you have a Rene Phillips or an Alfred Carlin. Then the kids have someone to shoot for, someone to beat." In Philadelphia, Rene Phillips admits he’s been suffering from PTSD, a disorder that he used to think was a myth. He has sleepless nights, depression, mood swings. He also sees it in his son, who was a running champion but now says he just doesn’t see the point to it anymore. Phillips says his top game is probably the five-minute blitz. Now, a picture of Katrina might come into his mind while he’s playing. He shakes it off. His goal is to get his national rankings back up, to regain his status as a master. After a year in which he lost nearly everything, he’s ready to get that title back again. Despite Spirit, No Medals This TimeYermolinsky bio up Alex Onischuk's Letter from Elista Jennifer Blogs on Election Day Chess in the Trees Knights and Sluggers Make Finals Wilt & Bobby: Not a Random Encounter Alex's Letter from Elista: Part II. U.S. Open Bonus GamesSarkar Takes Kings IslandNew York and San Fran Make Finals GM Joel on Reducing DrawsDr.D's Check-Up Alex's Letter From Elista: Part IIIGM Joel on Computer AnalysisAction in Atlanta Top Ten Things Chessplayers Can Be Thankful ForPicking Up the Pieces in New OrleansKramnik Fritz Match Begins With DrawKramnik Misses Mate in OneHikaru Tops CongressU.S. Chess League Final Clash Pruess and Khachiyan win in L.A.